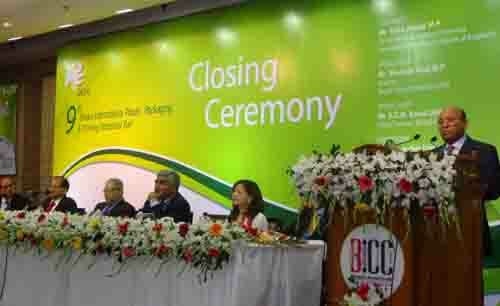 Bangladesh Plastic Goods Manufacturers and Exporters Association (BPGMEA) and Chan Chao Int’l Co. Ltd. Jointly had organized the 9th International Plastic Fair 2014 (IPF 2014) in Dhaka, Bangladesh. The chief guest (Hon’ble Minister, Ministry of Finance, Peoples Republic of Bangladesh Mr. Tofael Ahmed M.P) close the International Plastic Fair 2014 and special guests were Mr. Morshed Alam M.P (Chairman, Bengal Group of Industies), Mr. kamal Uddin (Former President, BPGMEA), Industrialists, businessmen and local & foreign participants also present there. Bangladesh Plastic Fair has made its market internationally. Plastic goods Manufacture Companies joined in this IPF 2014 exhibition over with 300 stalls with 15category. Country’s GDP (per head) and remittance has reached at about 1000$ and 17.65 b$. Locally plastic production and sell is worth of about 18000 crore Tk. and this sector giving tax about 2000 crore Tk. per year. In 2010-2011 export of plastic product was worth of 68.7 million USD and in 2012-2013 FY it was 84.51 million USD. Plastic Product is making good market in USA but nowadays without GSP it’s getting interrupted. Now because of tax on Plastic Product its price will rise about 20%. For long time BPGMEA is trying to set-up a Plastic Industry Area and if it gets this area then plastic business will be increased and int’l market will be vast for Bangladesh. BGMEA gives business facilities to its member by Trade Dispute that’s good in this sector. Polymer Industry is essential where Govt. help is needed. Previous:The 9th International Plastic Fair 2014 Opening Ceremony, Date: 20 February 2014.